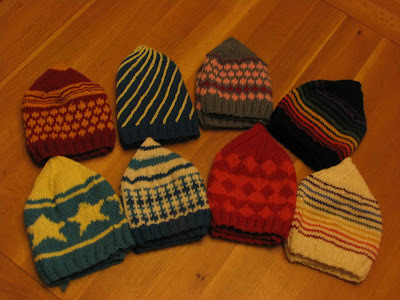 On Monday afternoon I decided to follow through on an old idea I had had to make my students hats for Christmas. I had two already so there were only 7 to do in 84 hours. I don't know why I'm crazy. Anyway, I did manage to get all but one done and they were huge hits. The kids thought it was really cool and the 8th graders were apparently way jealous. 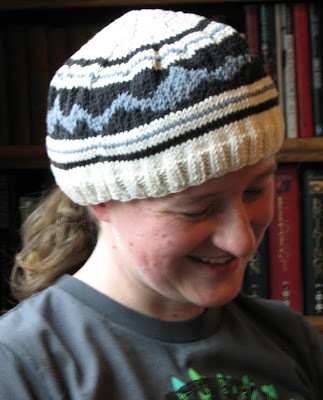 I wrote a couple of limericks (we just studied them) to explain why ends weren't tucked and the last hat wasn't done and poor S had to wait until the weekend when I dropped off his finished hat. Q took a picture of me in it before it went to its home. I think I like it best of all and Q thinks the wave chart I created for it looks like sound waves. He thinks I should make some for my shop. We'll see. I'm having so much trouble getting all my Christmas gifts done and have several custom orders in the works for various people (including a sock monkey!) that the idea of adding new product seems absurd. 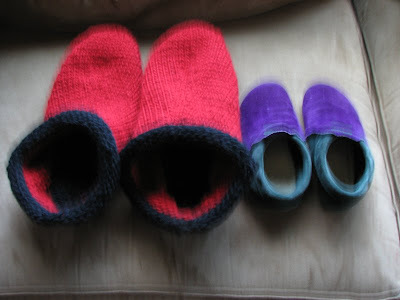 Here are the slippers I'm making for my dad, currently felting in the washing machine. They've been a bit of a time sink due to yarn amount issues. (I had to entirely reknit the first one when I ran out of the correct dye lot.) I really hope that they felt down well. Doesn't the red make them look like archetypal clown shoes. I had to put my own slippers next to them to give scale. The flowers are from Q's folks. 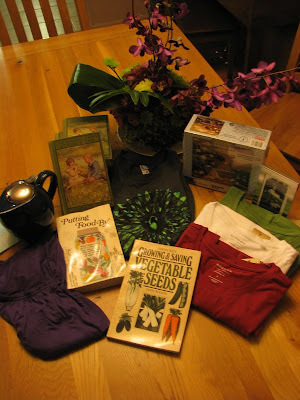 the books and puzzles were Q's perfect thrift store finds; the leaf shirt was from Q too. 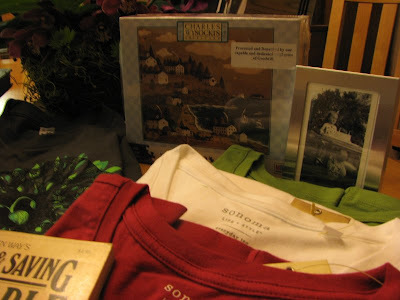 Mom got me the Bobbsey Twin books as an early birthday present this summer and the clothes and picture frame are also from Mom and Dad. Mom knew I've been looking for small silver frames to put the old pictures I have in for display in the guest room. As you can see, the picture from her second birthday fits perfectly. Anyway, we fly out on Thursday and I have 4 sets of tea towels to make as well as a few other surprises before we leave! EEEKKK! Luckily, I've always felt sleep was overrated. Happy Holidays!